Home »Linux »Linux Home Server »Home Server Network Setup »Home Server OpenVPN Windows client. 01-Sep-2013: updated for XCA certificate creation. In the OpenVPN bridge article you could see how to setup the server side. Now we show the client side on Windows 7. We use the OpenVPN GUI that you can get from the official OpenVPN download page, it’s in the latest Windows installer. One of the problems with this GUI is that if you edit the configuration using the internal editor on Windows 7 or Vista, you cannot save the changes because you have no Administrator rights in the config directory. In order to do so you need to start the GUI as Administrator. To do this, right click the GUI icon, then run as Administrator. You may need to exit the taskbar icon first. For normal use, you don’t need to run as Administrator. Using your certificates setup generate certificates for the Windows machine with the XCA program. Use your wpl-uk-ca as root certificate and as template use HTTPS_client. Press Apply all before you go to the next tab. 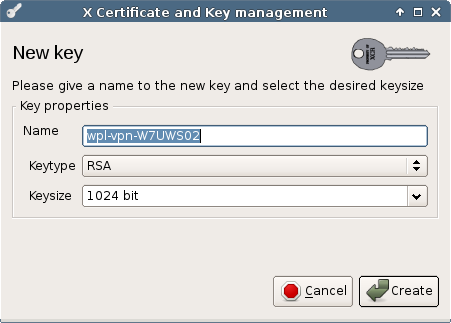 In the subject tab, choose Generate a new key to create a key for our new certificate. Fill in the internal name and commonName. The commonName should be the windows machine name with the wpl.uk domain suffix. Most values should be fine for a normal client. This should be fine for a normal client. Press Ok to create the certificate. 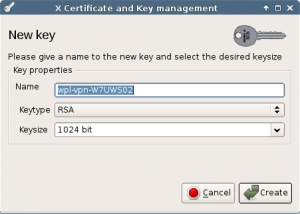 Export the key and certificate and put them on a USB stick. From the home server, also copy /etc/openvpn/homsrv-tap/ta.key as ta-wpl.key to the USB stick. dev-node "Local Area Connection 2"
This homsrv.ovpn file must be DOS formatted. You can use dos2unix to convert a Linux written config to DOS format. On the laptop, install the OpenVPN GUI. The files on the USB stick must then be copied to C:\Program Files\OpenVPN\config. You need to do this copy as Administrator. After you start the OpenVPN GUI you can control the connection with the icon in the taskbar. If all goes well, after you connect you should have got a IPv4 and IPv6 address from your Home Server. Remember that the server works in bridge mode, so both IPv4 and IPv6 dhcp servers of your Home Server provide addresses and other data to our Windows client. Note that a standard XP client only gets a IPv4 address. I noticed one thing, if you already got a IPv6 address before you started OpenVPN, Windows keeps using that IPv6 address, even while it got a new address from our Home Server. I don’t know if this is caused by Windows or OpenVPN that is not yet full IPv6 aware. If you original only started with a IPv4 address (in most cases that is true), the IPv6 connection will routed via your Home Server as it should be. I have seen this with OpenVPN versions 2.1.3 and 2.2.1.